Hobbydecal has sent me a bunch of sheets and so I'll combine some of those in the same scale in this review. For more information on the pros and cons of dry transfers, please visit this review. I should mention that overall, dry transfer decals will provide a superior result as there is no need to clear coat the model and they are quite thin. The two in this review are 48007 for the Me-262 and to the right 48-008 for the Hurricane. 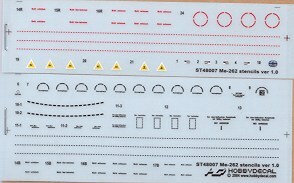 As with the other sheets, the decal placement guide can be downloaded at the HobbyDecal website. Visit the hyperlink below. As a note, I should mention that I generally slightly degrade decal scans to prevent copying. If you would like your product reviewed fairly and quickly by a site that has nearly 250,000 visitors a month, please contact me or see other details in the Note to Contributors.